It’s catch-up time for me. Three stories finished in 2014 so far. I hit burn out mid-January and again mid-February (mostly because I didn’t give myself time to recover in January). I’ve got A Round of Words in 80 Days time to make up. Sponsor stuff went to the wayside when I was in panic mode. 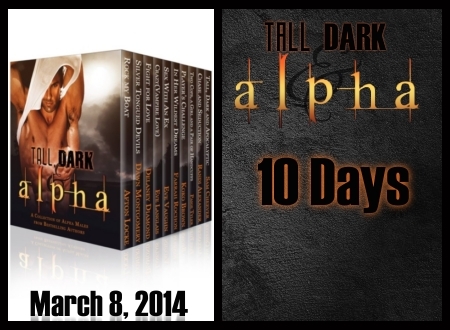 We’re less than 10 days away from Tall, Dark & Alpha’s release. This is a little gem I made for the FACEBOOK FAN PAGE. We hit 2500 likes so far! Amazing, right? I can’t wait until this set releases. It’s been a fascinating journey in indie publishing. Ten very different experience levels and personalities came together to create the Tall, Dark & Alpha Boxed Set. Every step of the way has been a learning process and I’ve enjoyed it so much! Wrote two novellas and one short story. First received a revise and re-submission request. Polite. Valid. I originally intended the story to be novel-length but time constraints forced my hand. We all felt the story was weaker with the shortened storyline. Second will release March 8th in the Tall, Dark & Alpha Boxed set. Thunder and Roses released from Loose-Id January 27th. The lead-up to release was promotional heavy. It was the longest novel I’d ever written and my writing partner and I were ready to see that baby born. It took over a year to get published, but man was it worth it. Tall, Dark & Alpha will release March 8th. The days are getting shorter and excitement is getting insanely awesome! It’s currently at the formatting company. Our ARC (advanced reader’s copy) will be available on or around Monday. Primal Hunger releases in print June 26th. My EC editor let us know that she’s stepping away from the editing world. I’ll miss her so much! She was amazing. Thunder and Roses made the Recommended Read list for USA Today’s Happy Ever After blog. Found out Thunder and Roses was in a Romantic Times magazine ad (got the digital image of the ad. So Awesome!). My Facebook Author Page hit 1k likes in January and the Tall, Dark & Alpha Fan Page hit 2.5k likes two days ago! I was invited to participate in a future boxed set. Military retirement was hit in the gut this year. I won’t say much except to ask that you pay attention to your politicians. Make sure you know what they stand for. Our family is still reeling. The Monster of Self Doubt attacked me hard this month. Many of my friends are going through hard times right now for one reason or another. Real life throws some nasty curve balls. All we can do as friends and fellow authors is give each other emotional support through the tough times. These same friends were there for me when I struggled after my injury in the military and again last year when I wondered if writing full-time was a bad idea. I will stand by them through anything. And I don’t say that lightly. I beta tested a new MMORPG. I can’t tell you anything about it except that it’s awesome and not yet available to play outside beta testing. I completed over 40 digital art pieces since January 1st. They consisted of memes, Facebook cover photos, advertisements, newsletters, holiday wishes, countdown reminders (like the one above), celebratory images, etc. There are more, but I’m too tired to finish the list. Forty. That’s a lot of playing around in an art program. Office has been rearranged (not completely organized yet, but it’s getting there). SuperChef (of Cooking By the Seat of our Pants or cbsop.com fame) hit 3.5 million pageviews in January for his cooking site. Dude. That rocks! Sunday I’ll be back to Round of Words in 80 Days with weekly goals. Right now I’m on an extended writing hiatus. It’s supposed to last until March 4th, but I’ve got the urge to write sneaking up on me at the craziest times. If you made it all the way to the end of this exhausting post, you totally deserve a reward. All I can offer is a virtual cookie, but I promise they’re calorie free without the weird aftertaste. I’ve missed you guys. It’s good to be back. It’s done. Final edits were completed yesterday on Silver Tongued Devils, my contribution to the Tall, Dark & Alpha boxset! I’m officially exhausted and in the fringes of burnout. This book was a challenge for a lot of reasons (most of them involved too much plot for the word count). My critique partners really enjoyed it, so I’m hoping *fingers crossed* my readers will love it as well. The book is due to release March 8, 2014. A New Giveaway for February! I’m giving away a $20 Amazon giftcard through Bitten By Books to one lucky winner! All you have to do is enter the rafflecopter contest. It runs from February 18th-22nd. I’d like to say a special thank you to the readers who have sent me emails regarding setting up an AuthorGraph account! It’s now live. Shoot me a message via the contact page or leave a comment here if there’s a book you own that’s not available on the list and I’ll see what I can do.